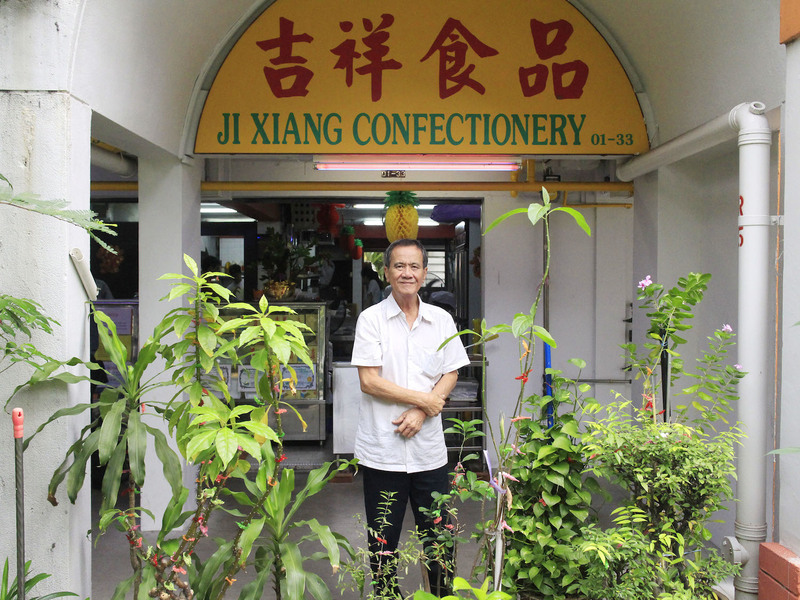 For the past 26 years, Ji Xiang Confectionery (吉祥红龟果, ‘吉’ meaning Luck and ‘祥’ meaning prosperity) has been a mainstay at Block 1 Everton Park, attracting an array of customers from the nearby offices and residences, who flock here daily in droves to have a taste of their famous ang ku kueh (红龟粿). A multiple winner of The Green Book Best Food Awards and more recently, the Slow Food Singapore Heritage Hero Award, the story of this family run business is as endearing as that of the local delicacy that is ang ku kueh. Each tray of ang ku kueh takes only seven minutes to steam before it’s ready to eat. Most of the fillings are already cooked prior to being placed in the pastry skin. Mr Toh, 67, Towkay and CEO of Ji Xiang Confectionery (吉祥红龟果) stands proudly outside his stall that’s been here at Everton Park since 1989. Till today, Mr Toh, 67, is still the resident towkay or CEO of the business while his wife continues to be the chief baker. Prior to this, Mr Toh spent over 15 years as a welder at a shipyard in Jurong, bringing home just $60 a month to the family home in Jalan Bukit Merah. During this time, his wife took up numerous baking classes and soon went into home-baking to help earn additional income for the family. 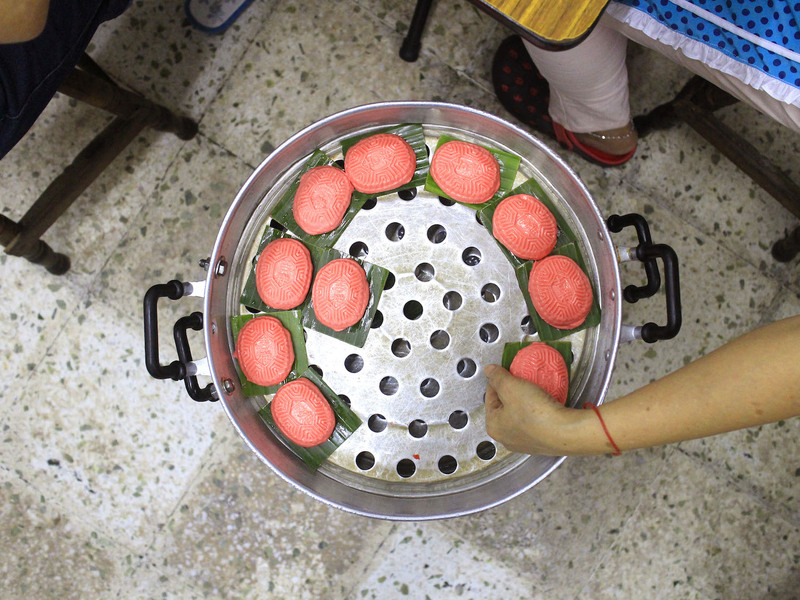 While she started out selling an assortment of kuehs, she soon found her forte in the unique delicacy that is ang ku kueh. While ang ku kueh has its roots in China, most Singaporean stalls, including Ji Xiang, have adopted the Nonya style of making this delicacy. The key difference being that of the much chewier red pastry skin that is primarily made out of glutinous rice flour, coconut milk, sugar and food colouring. Business for Mr Toh and Ji Xiang started out in 1985 by selling only two flavours, peanut and sweet bean paste, to itinerant stalls and hawkers around the area. Their popularity and also marketing genius of placing their shop name ‘吉祥’ on their kuehs, instead of the usual ‘寿 ‘ (meaning longevity), soon garnered them a loyal following which led to the setup of their space at Everton Park in 1989. 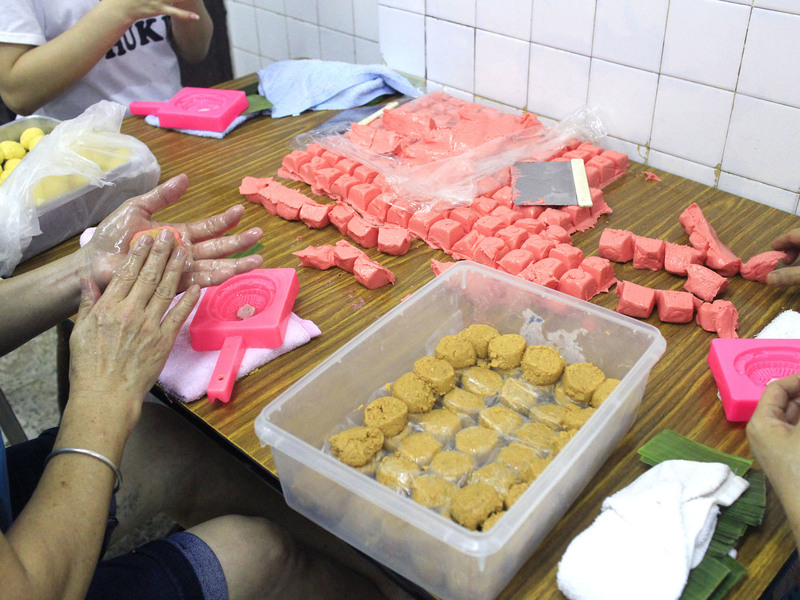 A marketing genius initiative adopted by the stall sees them using a custom made mould with their shop name in place of the usually usual ‘寿 ‘ (meaning longevity) found in most other ang ku kuehs. 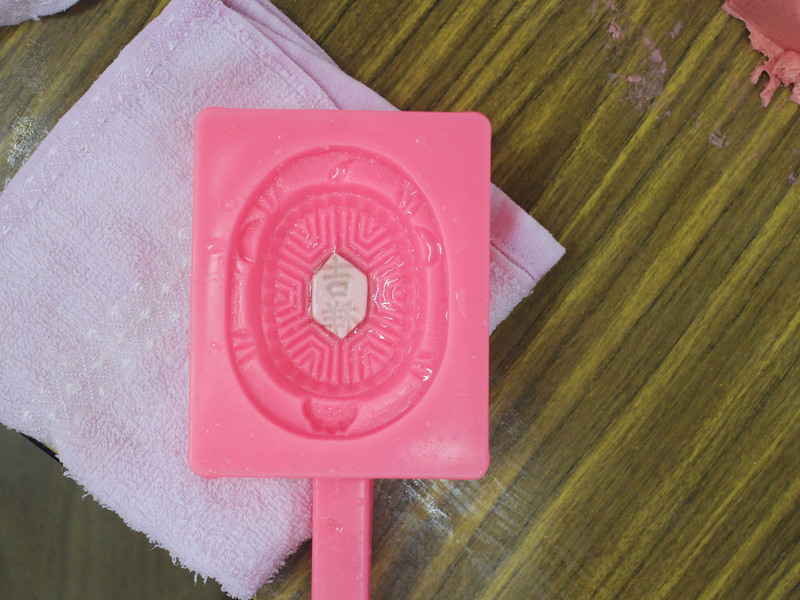 While some heritage hawkers abide by strict secrets and guidelines to their craft, Ji Xiang has over the years, managed to balance keeping up with the times while ensuring that quality is ultimately still the key element in their product. 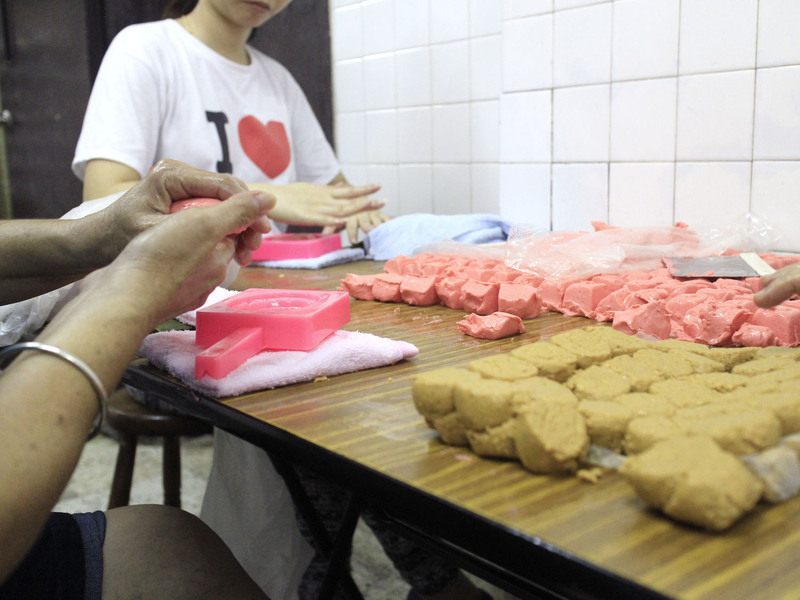 One such factor is the insistence of filling and moulding the ang ku kuehs by hand to ensure that the skin remains thick and chewy. It may be hard to notice at first, but the ‘Red’ (红) of Ji Xiang’s kuehs actually have a tinge of orange to make it more appealing, and was done during the late 80s when there were worries about the harmful effects some food colourings had. 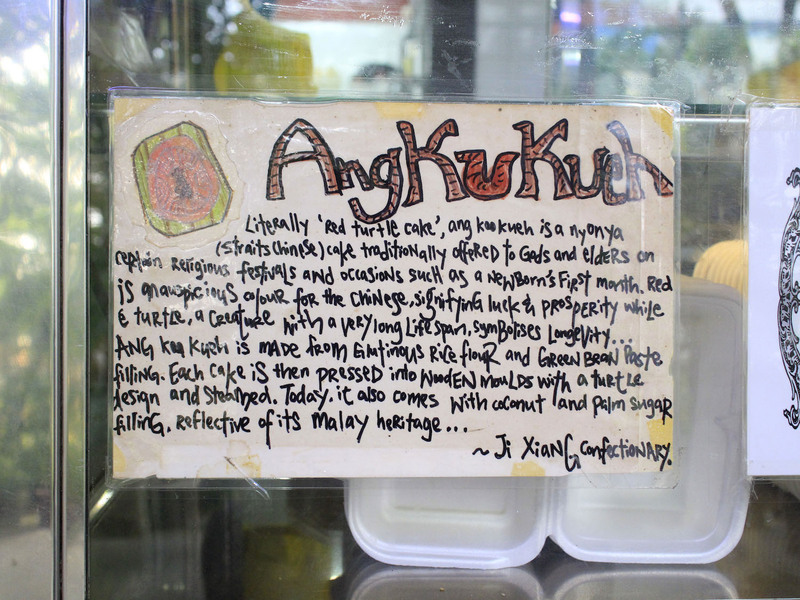 The story and secrets of Ang Ku Kueh. Each square will make up the pastry skin for each individual ang ku kueh. Though there is no official confirmation on this, Ji Xiang is also perhaps the first stall in Singapore to introduce new flavours beyond the traditional peanut and sweet bean paste, this after Mr Toh received feedback from customers who were keen on new and exciting flavours. Today, Ji Xiang sells a total of eight flavours that include, salty bean paste, corn, coconut, yam and durian (seasonal), each easily distinguished by the different colour of the skin. Typically, the stall can sell upwards of 2,000 pieces of ang ku kueh in a day and are particularly busy during the Hungry Ghost Festival and 7th Day of the Lunar New Year (人日). Their ang ku kuehs, which symbolise prosperity, is also a frequent feature as a gift to celebrate the turning of a month old of a child (满月). 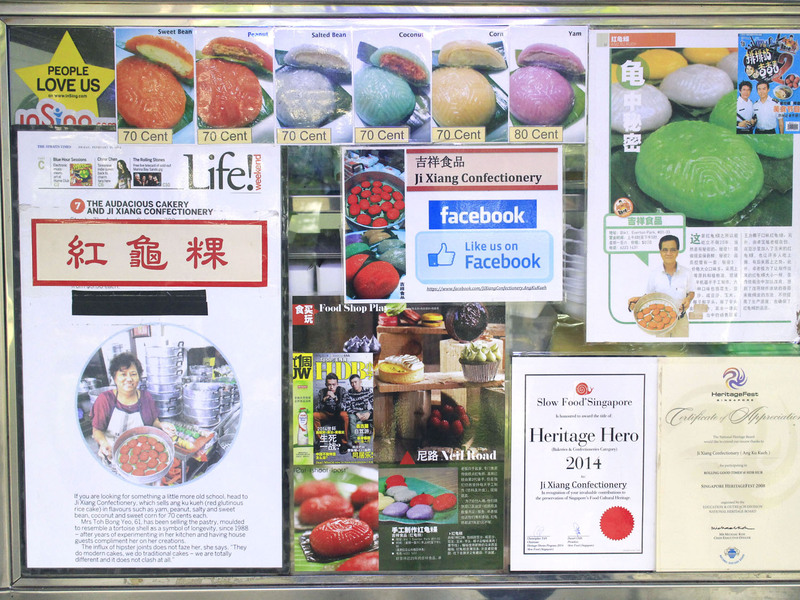 The who’s who all give their thumbs up to Ji Xiang Confectionery. 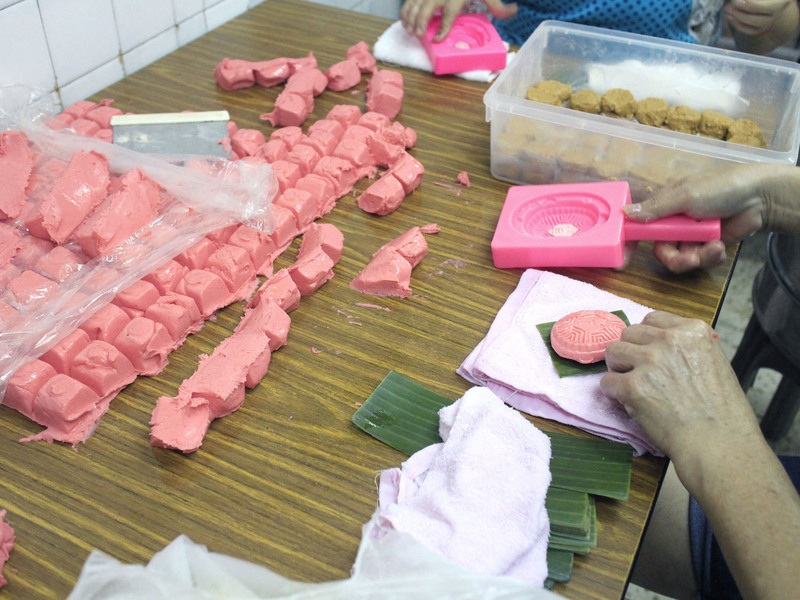 Ji Xiang insists on moulding each ang ku kueh individually to ensure that the texture and amount of filling is kept top notched. Today, Mr Toh has his two sons and daughter-in-law on board to help with the operations. Both of them are slowly bringing in new ideas, with plans to expand and improve the business in time to come. In the meantime, here’s how a day pans out at Ji Xiang Confectionery. 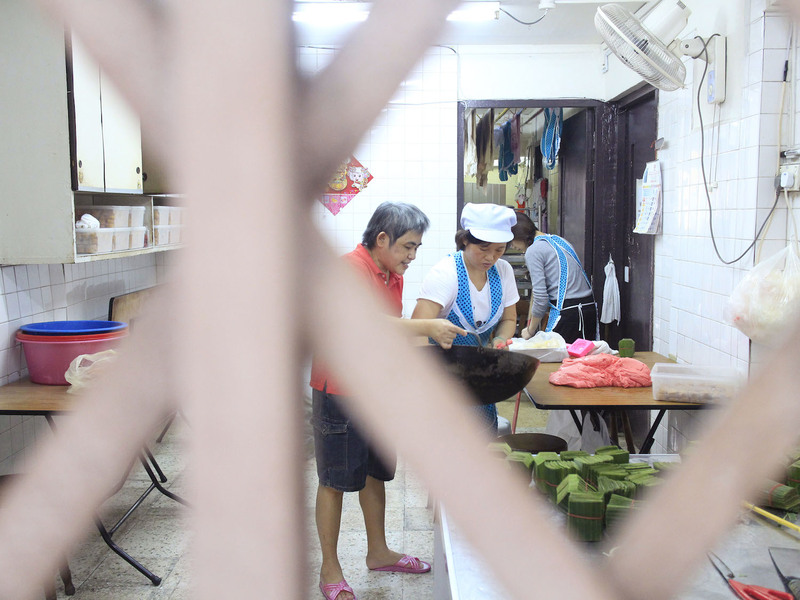 8am – The remaining workers start coming in and together they help create 2,400 of the peanut and sweet bean paste kuehs within an hour! A typical worker can do four ang ku kuehs within a minute, while a skilled one can do six! Each tray of kueh then takes only seven minutes to steam before they are sold to awaiting customers. 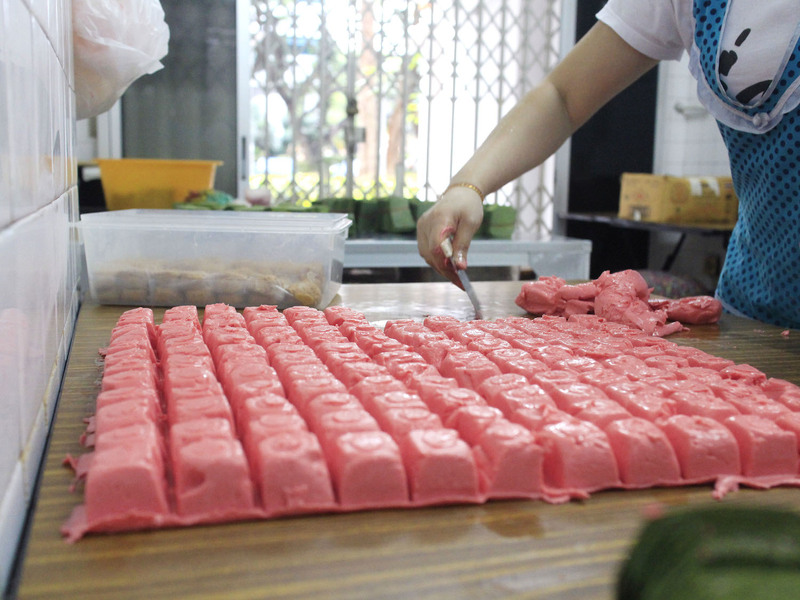 9am – Workers start to prepare the remaining flavours depending on the expected demand. Shop opens for business. An average worker can make a total of four ang ku kuehs in a minute while an experienced one can do as many as six! Many hands make light work. The staff totalling 16 sell upwards of 2,000 pieces of ang ku kueh a day! Ji Xiang Confectionery is located at the following address.